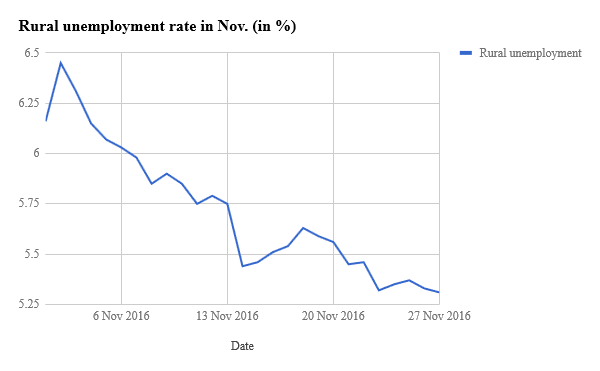 What is the overall impact of demonetisation on employment in India? It's been almost a year since Prime Minister N.Modi announced the demonetisation exercise. It was quite a surprise move on the part of Indian government to weed out the menace of black money, counterfeit currencies and terror funding. A year after the said move, the media has been abuzz contemplating the success and/or failure statistics for the same. There are many other aspects of the issue namely social costs, political gains and economic impact, however as a young citizen of the country, what concerns me most is the impact it had on employment opportunities for the millennial generation. India, is the country with 64.4 % of its population in the age bracket of 15-59 years. This also means that we have most of our people in the productive work age bracket. Hence it goes without saying that in order for India to reap the dividends of its demographic potential, it has to first equip its workforce with the necessary skills and provide the requisite employment opportunities to its people, to be able to contribute to the national economy. The demonetisation drive in the recent past however for all its potential gains, might have wrecked the plans. Informal economy constitutes a large chunk of Indian economy(around 80%), and it transacts mostly in cash payments alone. The economy demand-supply cycle chain has been on decline generally (even after a year). Since consumer demand has slowed and consequently industrial production has declined, employment generation has been adversely impacted by the currency demonetisation drive. The manufacturing sector which accounts for the highest employment of skilled and semi-skilled labourers, is witnessing slowdown in production; not only less jobs are being created but lay-offs are also taking place at a higher rate. The job losses might be temporary, however they still affect the daily wage laborers and other labour-intensive sectors like textiles, garments, leather and jewellery. We might bounce on track, as the economy slowly recovers but the losses even with little gains might leave some long-lasting scars on the public psyche. So, do you folks too agree with me on the subject? Or are your thoughts a bit different? Would be delighted to know in the discussion below. I read a blog post about how demonetisation took away 1.5 Million jobs in India and how thousands of companies are saying they won't be able to hire. This article, if I remember correctly, got published around July this year. Has it really become a doom season for employment? 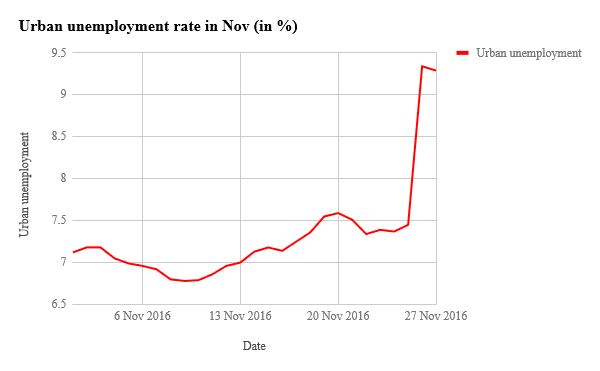 While employment seems to be affected, stock markets on the other hand seem to be soaring high. I think reduction in currency circulation post demonetisation will show its effects for 6 months to 1 year. But now, if infrastructure projects start booming and financial service companies start increasing, the jobs will return. Would definitely love to hear more opinions on this. When it comes to impact of demonetisation, we can have a look at a recently published report by the All India Manufactures Organisation. The report surveyed over 10000 businesses from across the country and this is what it had to reveal. In trading organisations 45% of the jobs were lost in the last quarter of 2016 when demonetisation was announced. In the same time period, medium and shall companies lost 35% of their jobs and large companies incurred a loss of 15% of their workforce. Exporters were hit with losses of 25% of their jobs. The job losses continued for the first quarter of 2017. The April-June quarter brought some jot as jobs increase was reported in across all these sectors to the tube of 10 to 15%. Apart from job losses, another negative impact was the reduction of wages. Since the industries suffered revenue losses they had to reduce remuneration of their employees. Demonetization, in my opinion, was a decision taken in haste without taking advice even the then RBI Chief Shri Raghuram Rajan. In an interview with Barkha Dutt, Rajan pointed out that preparation was not up to the mark and before implementing such a step, the govt. should have prepared to replace at least the currency used in daily economic activities by the people for conducting their businesses. Many people were killed unnecessarily. We cannot understand the pain of those families who lost loved ones. MSME's were hard hit. The local vendors lost business and thousands lost their jobs. Practically, no black money was recovered. The GDP growth rate came down to 5.7%, making a 4 year low. Although Demonetization may have some positive effects in the future, it certainly has failed terribly and has only caused loss of wealth, business and lives of the poor. If the govt. wanted to make India a digital economy, it could have taken alternate routes instead of causing such trouble. I am sure the genius minds holding top positions in decision making bodies could come up with better proposals.